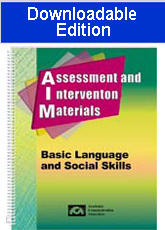 This is the downloadable version of the AIM Kit. It includes the entire book plus all contents from the supplemental CD. Save money by downloading this product! Here is a collection of practical assessment and intervention tools that you will use on a daily basis in language development programs for students with autism, developmental disabilities, or augmentative communication needs. This resource can also be used with adults who have word-retrieval difficulties. The product includes a variety of observational assessment forms and checklists that focus on basic skills such as expressing needs, requesting assistance, focusing attention, responding to yes-no questions and taking turns. You can use these forms to identify small changes that occur in performance over time. The product also includes reproducible picture symbols, sign language symbols, vocabulary lists, communication boards, social interaction stories, and instructional activity suggestions for teaching basic language and social skills. The social interaction picture stories help students learn to recognize appropriate social behaviors. The entire book plus the content of the supplemental CD are all included in the downloadable version. The supplement includes resources such as full-color versions of picture symbols and communication boards. It also includes full-page displays of each picture symbol. You can display these pages on your computer when teaching basic vocabulary to students. This downloadable product is made up of PDF files. The file size is about 20 megabytes so it may take a few minutes to download with a high speed internet connection. If you are unable to open the sample pages in this ad, you need to obtain Adobe Reader before using the file. Adobe Reader is available FREE at www.adobe.com.